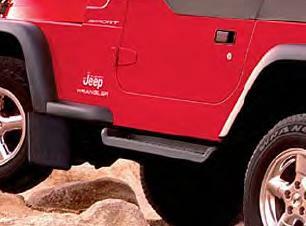 These Molded Side Steps for the Jeep Wrangler are the production steps included on Sahara and optional on SE and Sport models. Made from durable black plastic with steel substructures, they provide stepping surface for easier entry and exit on your 2001-2006 TJ Wrangler. Black, production style. Complete set of 2 with hardware. Took me a while to find these even after the dealer told me they were no longer available. Super fast shipping and came in original mopar packaging. They look great filling up that empty gap under the doors. Only complaint they came a little danaged from Fedex but a quick and easy fix. Over all great shopping experience and great quality product. Bought these for my 2006 Jeep Rubicon. They fit perfect, exact fit into the slots on the outside of the frame rail. They are sturdy, look as I would expect for an OEM item, and they arrived in the original Mopar box. I liked the simple, but effective design solution of the supplied U bolts. With the specifically designed U bolt (one threaded side longer than the other), it allows you to readily insert the U bolt into one pre-drilled hole in the frame rail, and then maneuver it to come out of the other pre-drilled frame hole. I installed the supplied nylon washer on the long bolt side of the U bolt, to make sure I didn't accidentally slide the U bolt to far into the frame rail and drop it where I couldn't reach it. Once the bolt was threaded in and out of both frame rail holes, I pushed the 2nd nylon washer onto the shorter bolt side, and that held the U bolt in place. I repeated the same process the second time, then easily slide the step into place and tightened down the bolts (I recommend using some thread sealant). I didn't try to work real fast, and would say it took me about 15-20 minutes for the first side install, and 10-15 minutes on the second side install. I would highly recommend this product, if you like the looks of this step, which I do. I had the same OEM step on a 1999 Jeep Wrangler, and it had held up well. These steps look good and were relatively easy to put on. Because of placement, there is some awkward wrenching to do but worked out OK. Solid construction and end result is a solid, stable step. Super easy and looks great! Put these in less than half an hour. Since these are MOPAR parts they fit perfectly with no muss and no fuss. Makes my TJ look complete and my wife likes the nice wide platform.